Bonded Hydra Cool Core creates a gel like feel with a fail-safe seal. Bonded Cool Core interior keeps core in place and holds water in so there is no excess "water puddles" in any low spots. Unique super soft material maximizes comfort and cooling capabilities. Aids in medical recovery, skin conditions, callused elbows, arthritis & excessive panting. These puppy beds have a unique bumper style crate mat combines thick Terry-cloth and bumper-style cushioning with some bright new colors!. Bed dimensions are slightly larger than ProSelect Crate dimensions so the bumpers are supported by the crate, softening crate's edges and providing an inviting nestling area for dogs. Our popular Crate Beds in bright, velvety soft terry, the hottest trend in puppy products. 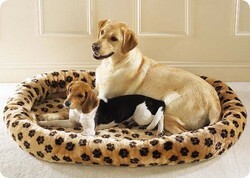 You will be amazed at how soft these beds are and your dog will thank you! High-quality terry stays cool in the summer, holds heat in the winter, and is completely machine washable. Available in the following stunning colors and sizes. Any pet would love resting on this ultra soft, lush puppy bed. Comfy bumper-style bolster design surrounds dog in cushioned comfort. 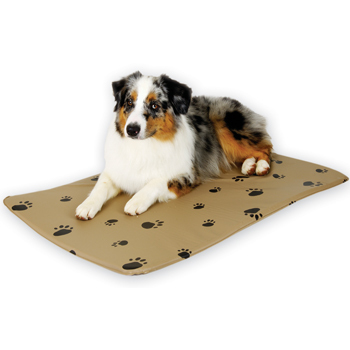 Gives pets an inviting place to nestle while protecting them from drafts. Made of easy-care plush fabric in a black pawprint design with a durable, wear-resistant canvas bottom. Tan with paw print pattern. Wipe with damp sponge or machine wash on gentle cycle to clean. Slumber Pet Plush Oval Bolster Beds are available in the sizes and colors listed below.